A revised timetable is being introduced on this service. That is all FDC say on their front page. When you look at the timetables you can see there are quite a lot of changes. This group of services have always been very complicated so its not easy to see the full impact of any changes. The 81C has certainly been cut back with a reduction at the Derriford end of the route at least. I know the 16:12 from Derriford is no more which is a shame as I do catch that one from time to time. The other thing I notice is that it seems that most Torpoint services have been taken out of Bretonside Bus Station and are just serving Royal Parade. I can see that catching a few people out next week, although I hope that First will have plenty of notices up and staff at hand to direct passengers. Monday - Friday, Saturday, Sundays. 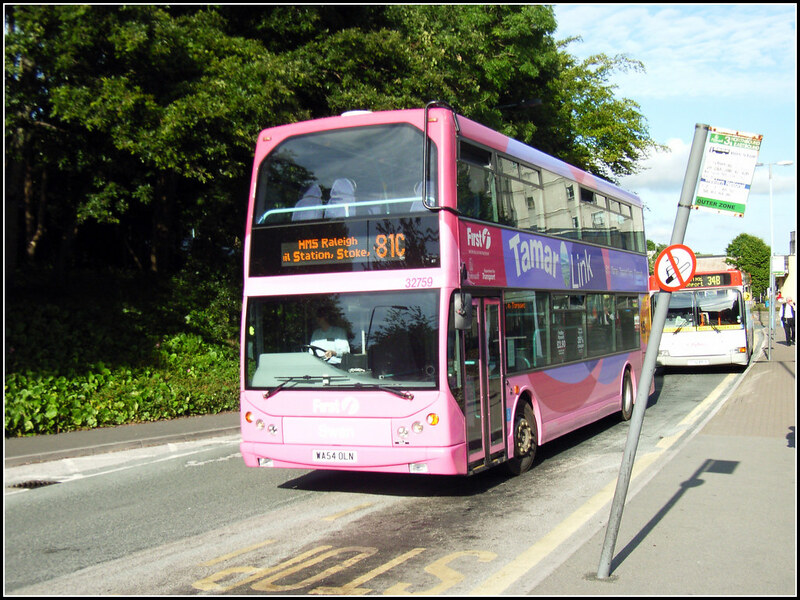 Following a recent retendering exercise, we are delighted to announce the commencement of the 581 on 27th September 2009, which replaces Service 181 run by First Devon and Cornwall. Developing the existing route, the 581 will serve Liskeard station for passengers requiring onward travel by train. Our new timetable has also been designed to interwork with First Devon and Cornwall services from Torpoint going into Plymouth city centre and Derriford Hospital, however we cannot guarantee that their times will remain the same or all connections will be made. We look forward to welcoming passengers aboard the new service. It is interesting that the times are totally different with First leaving Torpoint at 0900 1100 and 1300 while WGL will be leaving Torpoint at 1000 1200 and 1400 Lets just hope that the passengers are being made aware that their bus will be a different colour and travelling in the opposite direction if they try using the old timetable next week! One final change by FDC that does not appear to be highlighted anywhere on their web site, although the new timetable is available online is the 82 which I guess reverts to the winter timetable with just two runs in each direction (Sundays only). Service 181 Liskeard to Torpoint will no longer be operated by First. The timetable for this service has been completely revised. Buses will continue to operate every 15 minutes Monday to Friday between Plymouth and Torpoint. Following requests some journeys will now operate via Union Street to provide quicker journeys to the City Centre. Also following requests more buses will now serve Great Park. Buses to Cremyll continue to operate roughly every hour, and buses to Derriford Hospital will now operate every 2 hours. Customers with FirstDay tickets however can transfer on to Ugobus services 7 and 15 on Royal Parade that provide 8 journeys per hour to Derriford Hospital. Didn't they try taking the Torpoints out of Bretonside a few years ago, which IIRC resulted in so many complaints they changed it all back again? Brave move or short memories I wonder?! More chaos to come on Royal Parade. With all the new services and now Torpoint buses waiting time on the Parade it will become a nonsense. Incidentally are you aware that PCC have reallocated many of the stops on Royal Parade in an effort to balance out departures?